Light rain and cloud started the day. 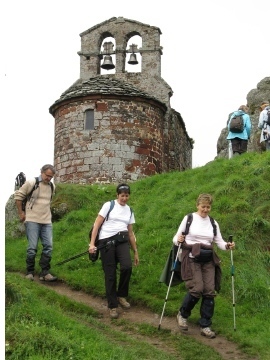 It was a gentle climb up over farmland to the small Chapel of Rochegude. Wonderful views down into the valley below. By now it was brightening up and the soft rain had stopped. The next stage was a steep and rocky descent 350m down through woodland to the valley floor below. Walking poles helped here as at times the path had suffered some serious erosion. Some found it a difficult and time consuming descent. Not good on the knees. From the bottom of the descent I was surprised to find a few kilometres later that the Way dropped steeply again into a very narrow valley and the village of Monistrol d’Allier. After a coffee in the local hotel the Way crossed the Allier River over an iron bridge built by Gustave Eiffel. What followed was one of the steepest climbs I have experienced. Part of the way up was the Chapel of Madeleine built into a rock face. I passed others taking a break or a snack and continued. I hoped that there were not to many of these climbs ahead in the next sixty-five days! As the climb ended an old man passed leading his flock of sheep. The light rain had started again and the sky was grey and sombre. As he passed me he stopped and stared at me. His eyes were sad and hollow. He told me he had a bad chest and many medical problems. He asked me to think of him on the way to Santiago. He paused then disappeared in to rain. Gently descending through pine trees and fields the Monument to Pilgrims lay ahead. 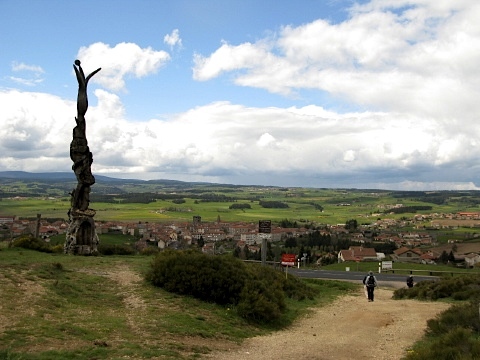 The town of Saugues lay a few kilometres ahead as the sun came out. I met Roger and Herbert on entering the town. We had a beer in the late afternoon sun. I found the Gite Communal (basic accommodation provided by the Mairie or town council). There I met Christophe again and we made arrangements for the evening meal. Marie and Sophie were also there, and others. We all shared food and talked about the first couple of days of the adventure. After finding the Gite Municipal and leaving the rucksack, I found a shop selling a great rain poncho. This was the answer as it would mean I could post back my waterproof overtrousers, rain coat and waterproof rucksack cover. I would go to the post office the next morning before leaving. TIP: I learned from others that day that your rucksack should weigh about 10 per cent of your body weight.